The Community of Madrid (in Spanish: Comunidad de Madrid) is one of the 17 autonomous regions in Spain. It is coterminous with the province of Madrid. Madrid is by far the largest city in the region, both in size and population - but the Comunidad de Madrid is more than just the Spanish capital city. The Comunidad has more than 7 million inhabitants, 3.3 million of whom live in the city of Madrid. These numbers mean that this area is one of the biggest metropolitan areas in Europe. Besides Madrid there are a couple good sights to visit, most make a nice daytrip from Madrid. The region lies in the middle of Spain, bordering Castile and León and Castile-La Mancha. In the middle of the comunidad lies the city of Madrid. To the north and the west of the city yoú'll find the mountains of the Sierra de Guadarrama. To the south and the east of the city are the hilly plains of central Spain. For sights in the city of Madrid, check the Madrid guide. 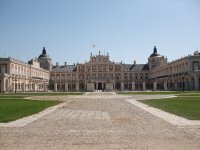 In Aranjuez you will find a royal palace, and some very large parks surrounding it. The palace is the main attraction in Aranjuez. It is open every day except Monday. In the Jardin del Principe, you can find the Casa del Labrador, which is a small palace decorated with statues. The park itself is bordered by the Rio Tago (Tagus), the same river that ends up in Lisbon. Near the palace you can find all kinds of buildings, all of which are somehow connected to the palace. The Houses of the Knights and the Chapel of St. Antonio are two of the best. The Palace and the surrounding area are listed as the Aranjuez Cultural Landscape on the UNESCO World Heritage list as a cultural landscape. In the city itself you can visit the Plaza de Toros and the bullfighting museum that belongs to it. The town of Chinchon is most famous for its beautiful Plaza Major. It seems that time stands still here. Chinchon is a beloved daytrip for many Madrileños during the weekend. In the mountains to the west of Madrid, lies the little town of San Lorenzo de El Escorial. 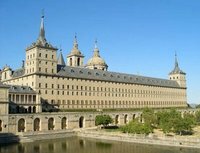 The town houses the huge Royal Monastery of San Lorenzo de Escorial, built by Felipe II is the 16th century. As it is easily reachable by cercanias from Madrid it makes a nice daytrip for tourists and Madrileños alike. The huge complex was built between 1563 and 1584. Besides being a monastary and a palace, it is also a mausoleum. It holds the remains of most of the Spanish royals that ruled during the last 5 centuries. The complex can be visited from october until march from 10.00 to 17.00 and in april until september from 10.00 to 18.00. Some parks and parts of the complex are opened a bit longer. (at most of the national holidays the complex is closed.) The Monastary was listed on the UNESCO World Heritage list as early as 1984. A somewhat dubious monument is the huge monument for the fallen, that was built during the Franco era. It houses the mausoleum of the dictator who died in 1975, and of 14,000 soldiers that died in the civil war (1936-1939), most of whom had fought on the side of the fascist troops. The monument built by prisoners of the regime, houses a huge basalique inside of the rocks of a hill, with a huge stone cross on top of it. Until recently a catholic mass was held on the 20th of November, the anniversary of Franco's death, but recent laws have forbidden these gatherings. 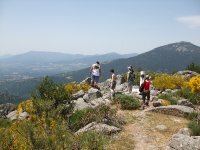 The mountain range of the Sierra de Guadarrama is a nice place to go hiking. From Cercedilla (reachable by Cercanias from Madrid, 1 hour and 20 minutes from Atocha), there are a couple of good walks including the one that follows the Romana Calzada, the old Roman Road between Madrid and Segovia. 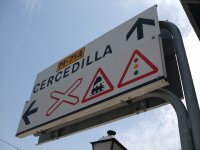 From Cercedilla you can also take another train that goes even higher up the mountain to Los Cotos, where there are some good starting points for trails as well. The cost from Atocha to Los Cotosf or both trains return is a very reasonable €10 (Oct. 2009). Other good starting points in the Sierra de Guardarrama are Manzanares el Real and the town of Guadarrama. Just north of Madrid lies the town of El Pardo. It houses one of the recidencies of the Spanish Royal family. The Royal Palace of El Pardo and the garden can be visited, and it is a nice way to get away from the city for many Madrileños. For Events and Festivals in the city of Madrid, check the Madrid guide. On the 23th of April, the anniversary of Cervantes' death, the Cervantes Prize is awarded to a writer as a lifetime achievement award. In the Spanish-speaking world this is the most prestigious award in literature. The award is presented by the King of Spain at the University of Alcalá de Henares. During the first two weeks of October, a huge outdoor medieval festival takes place in Alcalá. It coincides with Cervantes birthday, and also with the arrival off the new students to the University. During the Festivities the historic center is turned into a medieval village, with parades, acrobats, jugglers, magicians, and artisans from all over Europe. It doesn't really start getting hot in Madrid until mid-May, beginning of June. In the summer it does get very hot since Madrid is inland and on a plateau. Summer can reach 45 °C. For the winter bring a thermal, sweater, and a jacket and some thin gloves as the weather does drop to 0 °C, but it's nothing too unbearable. The Spanish however, do feel that the Madrid climate is horrible. There is a saying about the weather in Madrid: "Del invierno al infierno" which translates "from winter to hell". The mountains to the west of the city are a nice retreat in the warmth of the hottest months, but even there temperatures can reach high temperatures. In winter some of the villages in the mountains turn into wintersport resorts. Madrid Barajas Airport (MAD) handles more than 40 million passengers a year between Spain's attractive capital city and hundreds of domestic, European and other intercontinental destinations. It is located 13 kilometres north-east of central Madrid. The metro is easy to access from Terminals 1, 2 and 3. As of May 2007 construction of the metro station at Terminal 4 is completed, which makes it easier to travel from Terminals 4 and 4S to the city. Line 8, the pink line, will take you from the airport to the metro station at Nuevos Ministerios and there you can switch lines according to your destination. A journey by taxi to the centre of Madrid can be made in under 30 minutes, depending on traffic. 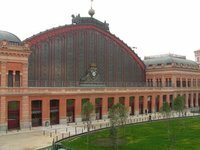 Atocha Station is Madrid's rail hub, and was build by architect Gustav Eiffel. It is on Line 1, the blue line, on the Metro. A feature of the train station is the large atrium filled with palm trees and a pond full of turtles. Seville - A high speed train (AVE) connects Madrid to Seville in 2 and a half hours. Valencia - A high speed service (Alaris) will make the journey in 3 and a half hours. Barcelona - The Talgo will get you from Madrid to Barcelona in about 3 hours. Málaga - in just under 3 hours. The other major train station in Madrid is Chamartin, which is easier to use if you have to take a journey to the north of Madrid. The Comunidad de Madrid is set in the middle of the country, so if you want to drive there coming from another country, you have to expect a long drive. Note that for a lot of the motorways in Spain you need to pay toll. If you want to go to the city of Madrid, parking can be a bit of a problem, but outside of the city center, and in most of the comunidad parking is a lot easier. Intercity buses connect most places in Spain. If you need to come from further, then you might be able to book a bus with Eurolines. The southern busstation at Mendez Alvaro is your likely place of arrival, and when you want to travel by public transport, you can switch here to the Metro or Cercanias. From Madrid the other places in the Comunidad can be reached by regional trains, called Cercanías. For most destinations you can leave at the stations of Atocha, Nuevos Ministerios and Charmartin. Two lines have a stop at the new station at Sol. From Madrid you can get to Getafe, on the Metro Sur network. Driving can be a good mode of transport, if you want to leave the busy streets of Madrid behind. There are numerous places where you can rent a car in Madrid. Busses run all over Spain, city buses run in the city of Madrid, but also to most other places in the Comunidad. Spain also has a network of intercity buses, that can bring you to places beyond the borders of the Comunidad de Madrid. This is version 44. Last edited at 11:32 on Jun 21, 14 by Herr Bert. 9 articles link to this page.